Our 2019 catalog is now available. Check it out on the under the Catalog Tab on the home page. We have added New Parts to the 2019 catalog. And as always, check our website for new parts added to our standard catalog line. 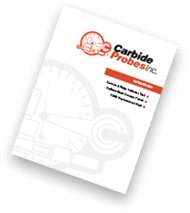 Carbide Probes, Inc. manufactures Tungsten Carbide and Ruby replacement Test Indicator Tips, AGD and Metric style contacts, Carbon Fiber Styli, Contracer Styli, Electronic Gage tips, CMM Styli and offers a wide range of Ruby and Carbide Ball diameters for any probe or special application. In machining terms, the end of the stylus is the tool tip when collecting measurement data with a probe. We offer a standard catalog line of the most popular styles which are in stock and ready for delivery. Need a custom made contact point or stylus? We specialize in economical, small run, custom-built contacts and styli manufactured to customer’s specifications. All of our contact tips and styli are manufactured at our facility in Dayton, Ohio.